It was a bitterly cold, cloudy afternoon. It had been a regular homeschool day, complicated by bad news from the plumber’s visit. Kids had scattered to their rooms and all around the house. The lingering effects of a cold virus threatened to overwhelm me with self-pity. I shuffled into the kitchen to heat a cup of leftover coffee, sniffling and favoring the ribs sore from coughing. I had been out of town two weekends in a row, and was in a reflective mood. There’s nothing like being away from home to help you appreciate being home. To top it off, I had just read the heartbreaking story of a college basketball player who died in a plane crash ten years ago. Read it and see if it doesn’t make you hug your babies closer. At that moment I decided to exercise my right as a sentimental Mom. The nearest child in the kitchen was sent to call in the troops. They thought I was going to assign a chore or check an assignment. Instead, voice breaking, I told them that I wanted everyone to stay in the room with me the rest of the afternoon. I didn’t explain that in the blink of an eye they would all be grown and living somewhere else. I left out the part where I admit that my lifelong pattern of relationships has been so shaped by the fear of rejection that I’ve often retreated into a shell. They looked at me, momentarily startled, and then hurried to gather supplies. Out came the blankets and drinks, as everyone snuggled in to listen for an afternoon of reading aloud. I was struck to the heart with gratefulness for their willingness to spend time with me when I asked. And in the same moment, I was struck by how few times I ask. We spent some pleasant hours around a crackling fire, sharing an adventure in medieval France. One of them posted on Facebook “Big fluffy blanket, warm corn cozy, mom reading aloud, fire in the fireplace… Perfect.” A grown sibling commented “Wish I was there.” Be still, my heart. I was reminded again that today is our life, and today we are making tomorrow’s memories. Maybe we can’t spend every afternoon reading aloud by the fire, but we can be intentional about taking time every day to connect. As mothers we hold the key to the atmosphere in our homes. My heart regrets the times when atmosphere and connection and relationships were neglected for things I thought were important. But I have today and I am changed, and God is in the business of restoration. Listen to that little voice that tells you to appreciate the time with your children. Spend a day of grace with your family. Put away the expectations and perfectionism, and see how precious the time really is. The day ended with takeout pizza and homemade chocolate cake and some episodes of Duck Dynasty. What began as an “off” day, with plumbing problems and boring phonics and an aching body, transformed into a comforting, heartwarming day of grace. Staying wrapped in my misery would have caused me to miss it. Some of the great joys of ten years of homeschooling are the memories of grace days. Those times of gathering together and snuggling down while I read until I was hoarse are still precious to me. My children are all adults now. All have careers and are self supporting. And they managed just fine without whatever lessons were assigned for that day. They love God and each other. That makes my heart sing. YES! Relationship before our stressed-out requirements. 🙂 It all comes out in the wash.
this is really beautiful Charlotte. I woke up thinking about Grace, how that is what my name is supposed to mean. I drew a hot bath and laid back with a book I am reading…How to Be the Lord’s Prayer. On the second chapter :Hallowed be thy name”. the author talks of how in ancient times names were given to commemorate or foretell the dreams a parent had for their child. Also how name changes marked life changes. Now Mom named me LeeAnn after her father and dad’s uncle Lee. As I ran amuck apart from the Lord I went by Oleander.–a poisonous shrub. Back to LeeAnn–gracious, grace. thank you Lord for parents unwitting vision and your design. While I don’t have children, that quality time thru a phone call or with the dogs or an email to my friend….God Bless you. Lovely thoughts, LeeAnn. These moments are truly the best of life. Love the meaning of your sweet name. Great post, Charlotte, and great reminder! They do grow up and leave so soon, don’t they. It makes me cuddle my younger ones closer and longer, too. We spent yesterday afternoon curled up in front of the fire with a good book, too. The kids kept begging for “one more chapter,” as Spanish lessons have been taking precedence over read alouds for several weeks, and they were ready for the break! It’s a constant balancing act, never the same and we never get it figured out permanently. I think it takes a constant listening and finger on the pulse of your family to figure out what needs precedence. Blessings to you and your family. Wow! I needed this. Yesterday was one of those off days. I am thinking that today this mom needs some cuddle time and a read aloud with her kids. Enjoy your day of grace, Debbie! It will refresh your soul and your home. I love this so much. Thank you. Sharing it on FB. So glad it spoke to you, Ronda–and thanks for sharing! That was beautifully expressed!!! Thank you so much for your transparency and encouragement! Thanks for stopping by to tell me, Charlotte! 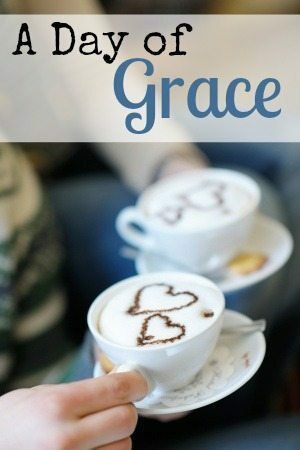 After a weekend away at a retreat for moms, i declared that Monday would be our “Grace Day!” Only to be shocked into the reality that homeschool never has worked for us. I awoke to MY life Monday morning and I feel as if everything i heard, the songs we sang and the hope i felt had just vanished like a dream. Is there ever a time when you just have to give up? I’m not sure what you mean by give up, but I do know that educational choices aren’t the end-all to solve issues. Sometimes we think a change in our situation will solve things, only to find that it just creates new problems. I know that we need to prayerfully consider what will work for our own family. Our school will look different from everyone else’s, and trying to cram my square family peg into a round hole will create stress and a feeling of failure. Remember being warned that you would face resistance when you got home? The enemy of your soul fights especially hard when you are doing a good work. Try to plug in to ongoing encouragement and support for what you are doing, in order to care for yourself and build your strength. Don’t let emotions take the driver’s seat of your life! to my little men, to look into their eyes and listen to their sweet stories, to sit and snuggle and read together. Grace indeed is the greatest gift. This was a timely message for me. I’ve found I’ve become too busy to cherish these coming last years of having the last of my children home. I’m in the process of regrouping and reprioritizing before it’s too late. Looking forward to soon having plenty of “grace days”. Today is a new day! It’s tempting to get caught up in regrets and STILL miss our opportunities TODAY. Blessings to you and your family! Oh Charlotte this was beautiful. This mama has one child at college and one living on her own and I miss them. They are safe and happy for now. And with Gods grace they will always be. I loved this thank you as I read this from my bed having to rest in bed after slipping on the ice and my knee swelling. We celebrate our birthday Saturday so from one 2/1 to another that was wonderful post and reminder. Thank you my friend! Having those grown ones helps us have this perspective, doesn’t it? Happy Birthday to YOU, Rhonda!! Great post. My babies are all grown, two are brand new parents, and the third one will be in August. Indeed, time flies by much too quickly. I am grateful for the times I stopped everything and we had ‘read-aloud’ time. We did this often, but not nearly often, enough. Thank you for opening the door for me to enjoy a trip down memory lane!